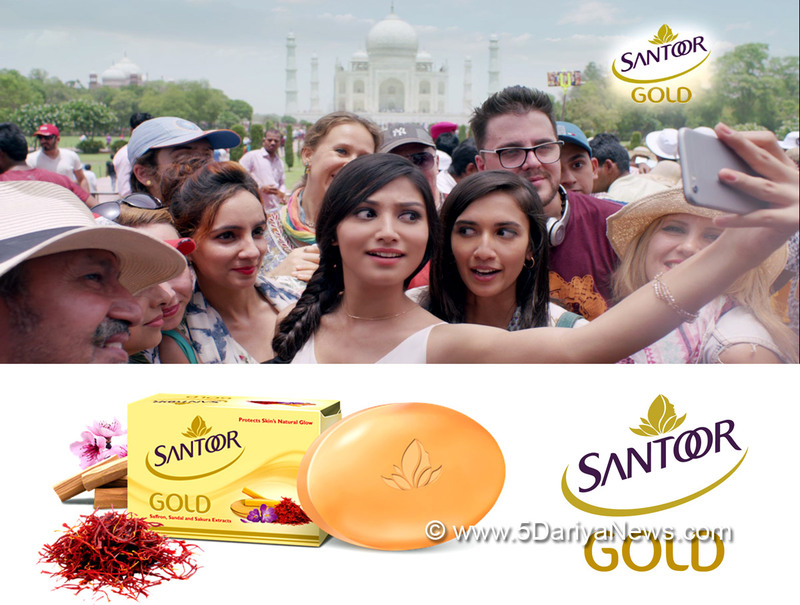 Wipro Consumer Care and Lighting has launched “Santoor Gold “ a premium soap from Santoor family . “Santoor Gold’ is made with the finest Kashmiri Saffron and goodness of Sandalwood that protects from skin damage caused by dust & Pollution and helps retain the natural glow of the skin.The product is available in 75 gms and 125 gms, priced at Rs. 28/- for 75 gms and Rs.165/- for a pack of three 125 gms soap as an introductory offer price. The product and pricing is at premium to the regular Santoor Sandal & Turmeric Soap and offers an international sensory experience.With increasing urbanization in India, Pollution levels are increasing in urban cities. Pollution affects our skin adversely. Our research has pointed out that women in India are concerned about pollution and its harmful effects on their skin. Cleaning of skin with trusted ingredients assumes significant importance in order to get rid of the impurities and pollutants deposited on the skin due to everyday exposure to dust & pollution.Mr. Anil Chugh, Chief Executive, Consumer Care – India, Wipro Consumer Care & Lighting, said, “Santoor, a leading toilet soap brand, has further strengthened its natural proposition and skin care protection by launching Santoor Gold, a new premium variant of Soap. Over the years Santoor has grown from a single soap brand to soap variants, talcum powder, deodorants, liquid soap, handwash, facewash and so on and has been constantly launching new brand variants and new products in tune with market demands and needs. For over 30 years, the brand has delivered on the promise of “Younger Looking Skin" through superior product offerings using natural ingredients.”Santoor Gold launch is supported by surround campaign in both TV and Digital medium. The TV commercial highlights the confidence that Santoor Gold can provide a young woman whenever she steps out of her home for work. The campaign is targeted towards young urban working women who face the challenge of pollution in her everyday travel to work. Wipro Consumer Care and Lighting, a part of Wipro Enterprises, is among the fastest growing FMCG businesses in India. Wipro Consumer Care’s businesses include personal wash products, toiletries, personal care products, wellness products, electrical wire devices, Domestic and Commercial lighting and Modular office furniture. It has a strong brand presence with significant market share across segments in India, South East Asia and the Middle East.